Yet another summer recipe for this season. Normally vadam is prepared using javarisi/sago. In this recipe I use aval/poha/rice flakes instead. 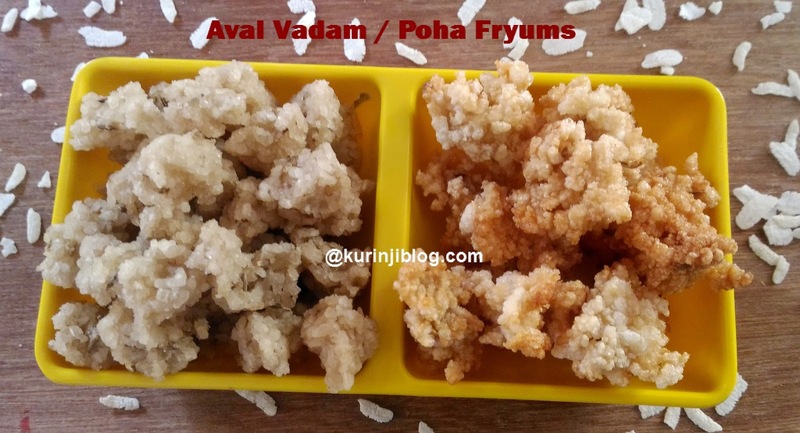 The vadagam is a nice snack and you can give it to kids as Indian popcorn. You can take advantage of the abundant sunlight of summer to prepare loads of vadagam and store it for winter. Click HERE to view more vadam and vathal Recipes. 1. Wash and soak the poha for 15 mins. Then strain the water using the strainer for 5 mins. 2. Grind the chillies into fine paste or chop them into small pieces. 3. 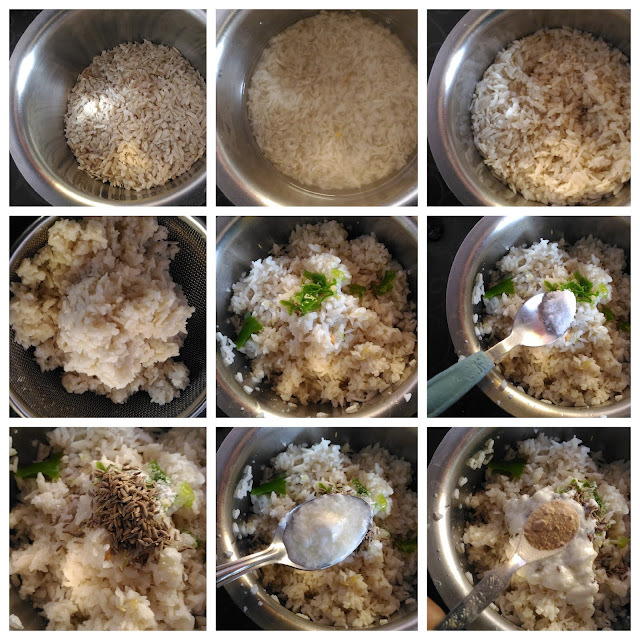 In a wide bowl, add soaked poha, chopped chillies, cumin seeds, curd, salt and hing. 4. Now mix the above mixture with your hand into fine paste. 5. Place a cloth or plastic sheet on the plate or floor where you get sun light. Wet your fingers with water then take the dough. Now make small balls from the dough and keep it over the sheet. 6. Keep the sheet under direct sunlight till they become crisp. This will take 2-3 days or depends on the size of the balls and the sun light. 7. Then remove them from the sheet and store it in a air tight container. 8. Heat the oil in a pan, add Poha Fryums and fry till they become crisp. Drain the oil and use. Healthy and yummy Poha Fryums / Aval vadagam / Rice Flakes Vadam is ready! 1. Adjust the chilli level and salt according to your taste. 2. Reduce or increase the quantity according to your preparation. 3. 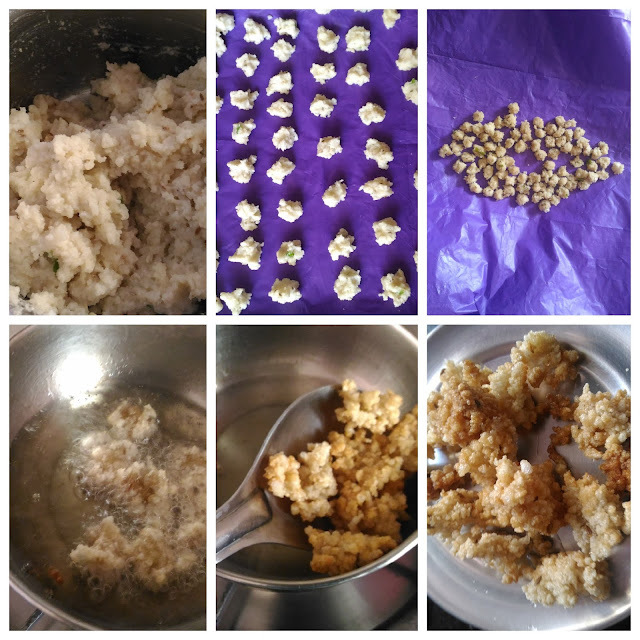 Suppose the mixture is watery, you can powder the dry poha and add to it. 4. If the mixture is too thick, add little bit water or curd and make the dough. 5. Use thick poha instead of thin one.